Two articles in the New York Times this week touch on what is at the heart of our budget woes: healthcare. First, Bruce Bartlett writes that the U.S. spends far more on healthcare than any other developed country, at 17.4 percent of GDP. A little less than half of that is spent through federal programs like Medicare, while the other half is spent by the private sector. Bartlett concludes that if we wipe out the private sector portion, through a national health-insurance system, we would spend roughly what other countries do. “… none of these fixes will be enough to raise the revenue we need to balance the budget, begin to pay off America’s debt and avoid the fiscal cliff. Nor can we cut spending enough to achieve those goals. An aging population expects the government to make good on promises for retirement support and increasingly expensive health care — so cuts in popular programs big enough to avoid higher taxes are simply not in the cards. The chart below depicts the cost of making good on past promises for government provided healthcare. 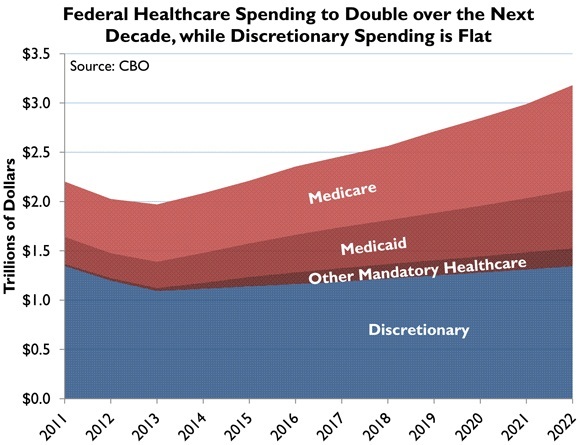 The CBO projects that federal healthcare spending will double over the next decade. Meanwhile, discretionary spending, i.e. things like defense, roads, etc., will remain flat. It just gets worse and worse beyond the 10 year budget window. That is, Obamacare fails to “bend the cost curve” sufficiently to avoid massive tax increases and/or deficit borrowing to pay for these new and old healthcare programs. Burman and Slemrod recommend raising the top rates on high income earners, but economists at the Tax Policy Center have found that rates would have to go above 90 percent to pay for all the spending. Raising income taxes is a distraction, and an economically destructive one. The problem at hand is healthcare and how to pay for it. We should drastically reduce the tax and spending subsidies of the healthcare industry, by taxing employer-provided health insurance and limiting the growth of federal healthcare programs.